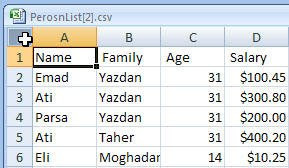 CSV file is a text based file in which data are separated by comma. It can be opened by excel so you can use excel functionality. Each row of data including the title is in separate line. Meanwhile, each row has data separated by comma. We need to write data to Response object. Meanwhile the content type should be text/csv also a header type of attachment should be added to response. Afterwards, column names are written to response then to actual data is written (each row should be just in one line).Finally you need to call Response.End to finalize your work. Important: if any part of data has comma, unfortunately the CSV file will be screwed up. What I did in the code is that I am replacing comma with space so I am sure that the only comma exists in each row is just for separating data rather than being part of data. this is great coding, and we've actually done the exactly same thing in vbscript for the company i work for and i was always thinking how it would look like doing it in C#. now i know :). by far, You are the best persian teacher I have seen to this day. How would the code look like, if you had to query the data out of a table? It would be nice to have an example using Linq. How would the code look like if you had to query the data from a database table? How would it look using linq? You could have used double quoted comma delimited string format. I appreciate your comment however I strongly believe it is not a good practice. let me give you an example if in a case you need to change the code you have to maintain that code in so many places however now there is a method that you change it. Please search for Coupling and Cohision in programming and you will see what I mean. hi this is very nice coding. what i espect from listview to csv file it work perfectly . this is a exellent coding for convert data to csv file. This would allow you to have commas in your datafields (although it would remove doublequotes from the data, so I guess it's a trade-off). CSV files allow for values with embedded comments if you wrap them in double quotes instead of stripping out commas as your code does. I write a couple of simple classes for both reading and writing CSV files at http://www.blackbeltcoder.com/Articles/files/reading-and-writing-csv-files-in-c. Some of your readers may want to see those routines as well. I don't usually comment on posts because I'm a bit of a lazy bugger. However, after weeks of searching something nice and simple from a list (not a nasty gridview), I found this and it's perfect. Yep, great job. Thank you for this. I am a complete novice with .net, and I was able to perfectly integrate this with my site. Would never have been able to figure it out on my own.